In my last post on Structuring For Success, we talked about new roles in the modern marketing organization. Many companies are recognizing that content is more than just “copywriting,” and they are creating new positions to focus on it. What they understand is what Larry Weber, author of Marketing to the Social Web, puts so succinctly, “…People don’t want to be sold to. What people do want is news and information about the things they care about.” They want thought leadership. Forrester classifies content this way: the more educational and problem-solving the content is, the greater impact it will have on potential buyers. 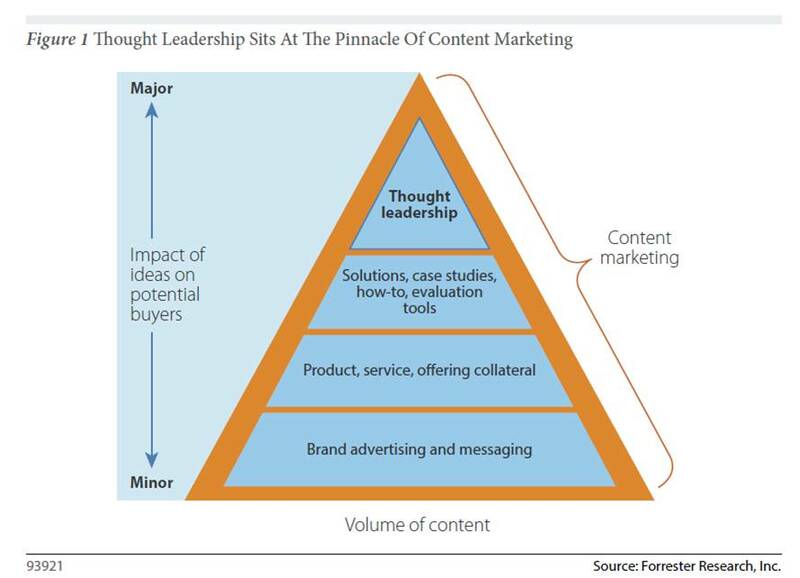 Thought leadership sits at the pinnacle of content marketing because it has the most potential to affect customer behavior. The thought leadership program I run for my company is effective because it speaks to financial institution and merchant concerns about payment methods. The series helps them understand where traditional form factors such a credit and debit cards are holding market share and where emerging methods such as mobile payments and prepaid cards are gaining traction. The program offers education without a sales pitch, and positions the company as a thought leader in the space… one that clients can trust to help them plan ahead. Ardath Albee, author of Emarketing Strategies for the Complex Sale, puts it this way, “By publishing content that shows buyers you understand their problems and can show them how to solve them, you build credibility.” If your company wants to earn credibility and trust, consider being deliberate with content marketing. This entry was posted in B2B Marketing, Content Marketing, Digital Marketing, Thought Leadership and tagged B2B Marketing, Content Marketing, Digital Marketing, Thought Leadership. Bookmark the permalink.